This flavor has been floating around here and there. I've heard of people making mimosa flavored cupcakes and since my friend Amy had a taste of one at a bridal show (she said she loved it), I decided I should try to make it. This was an impromptu trial as I was in the cake shop this afternoon and decided to buy some champagne flavoring. I added orange flavoring to a vanilla cake recipe and topped it off with champagne flavored buttercream. I think for my next attempt I might try adding some orange zest to the batter - I think I might also do a creamy orange mousse filling and then top it off with the champagne flavored buttercream. This attempt did come out pretty well though and I'm pretty sure it's Rodney's new favorite! 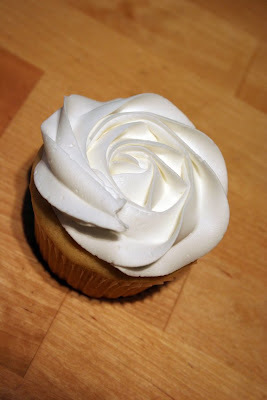 Your icing is so perfect. I absolutely love your work and your blog! You've done so truly beautiful stuff. so i typed in "champagne flavored buttercream" into google and this is where it brougth me... and im glad!